Vehicles with manual transmission may be towed in with a tow bar or a tow rope or with the front or rear wheels raised. Vehicles with automatic transmission may be towed in with a tow bar or a tow rope or with the front wheels raised. If the vehicle is raised at rear, the automatic gearbox is damaged! A tow bar is the safest way of towing a vehicle and also minimises any shocks. Only use a tow rope if a suitable tow bar is not available. The following guidelines must be observed when towing. Release the clutch particularly gently when starting off or depress the accelerator particularly gently if the vehicle is fitted with an automatic gearbox. On vehicles with a manual transmission, only push down on the accelerator pedal once the rope is taught. The maximum towing speed is 50 km/h. Switch on the ignition so that the steering wheel is not locked and so that the turn signal lights, horn, windscreen wipers and windscreen washer system can be used. Take the vehicle out of gear or move the selector lever into position N if the vehicle is fitted with an automatic gearbox. Please note that the brake servo unit and power steering only operate if the engine is running. If the engine is not running, significantly more physical force is required to depress the brake pedal and steer the vehicle. If using a tow rope, ensure that it is always kept taught. If the gearbox no longer contains any oil because of a defect, your vehicle must only be towed with the driven wheels raised clear of the ground or on a special breakdown vehicle or trailer. The vehicle must be transported on a special breakdown vehicle or trailer if it is not possible to tow in the vehicle in the way described or if the towing distance is greater than 50 km. To protect both vehicles when tow-starting or towing, the tow rope should be elastic. Thus one should only use plastic fibre rope or a rope made out of a similarly elastic material. Attach the tow rope or the tow bar to the towing eyes » page 166, Front towing eye or » page 166, Rear towing eye to the detachable ball head of the towing equipment » page 121. We recommend using a tow rope from ŠKODA Original Accessories available from a ŠKODA Partner. Towing another vehicle requires a certain amount of practice. Both drivers should be familiar with the particular points about towing a vehicle. Unskilled drivers should not attempt to tow in another vehicle or to be towed in. When towing, respect the national legal provisions, especially those which relate to the identification of the towing vehicle and the vehicle being towed. The tow rope must not be twisted as it may in certain circumstances result in the front towing eye being unscrewed out of your vehicle. Remove the cap carefully as follows. Press on the left half of the cap in the area of the arrow » Fig. 148 - A. Remove the cap from the front bumper. Screw the towing eye in clockwise by hand up to the stop » Fig. 148 - . For tightening purposes, we recommend, for example, using the wheel wrench, towing eye from another vehicle or a similar object that can be pushed through the eye. In order to reinstall the cap after screwing out the towing eye, insert it in the mounts and then press on the right side of the cap. The cap must engage firmly. The towing eye must always be screwed in fully and firmly tightened, otherwise the towing eye can tear when towing in or tow-starting. 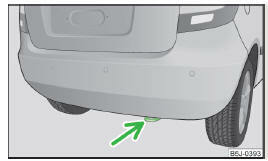 The rear towing eye is located below the rear bumper on the right » Fig. 149. The removable towing ball may be fitted and used for towing on vehicles with a factory fitted tow hitch » page 121, Towing a trailer. Towing the vehicle using the towing device is a viable alternative solution to using the towing eye. The detachable ball rod and/or the vehicle can be damaged if an unsuitable tow bar is used. The detachable ball rod must always be in the vehicle so that it can be used for towing, if necessary.